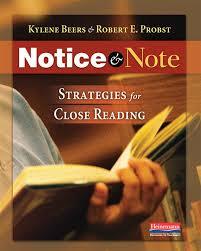 Notice and Note, Strategies for Close Reading, by Kylene Beers and Robert E. Probst, is a how-to manual for helping students read critically. Through the use of six different “signposts,” the students are taught how to pay close attention while reading strategically. The authors provide excellent instructional lessons that the reader/teacher can use to learn the strategies themselves and then present the same instructional lessons to their students. Also included in the book are chapters on thought-provoking questions covering such varied topics as the close reading, the need for rigor, and the different role of talk in the classroom. Especially impressive that research is included throughout the book. There are some fantastic books that take the education world by storm, but they lack the research-based studies that allow us to have confidence that what they are promoting has been determined to be credible and worthwhile. In Notice and Note, however, research is cited. In addition to the chapters that cover the introduction and methodology of each signpost, there are separate chapters devoted to several often asked questions that persist in the ELA world. For example, one chapter is entitled “Why should we read fiction?” The authors cite psychologist Keith Oatley’s studies of the effects of reading fiction as reported in Scientific American. He reports “Recent research shows… that reading stories can actually improve your social skills by helping you better understand other human beings (2011). In “What Is the Role of Talk,” the authors reference dialogic talk. They used the research of VanDeWeghe (2003) showing that in dialogic classrooms, students do more of the questioning, and as a result, achievement increases. By including this research, my advice to use dialogical journal entries had more validity. In the 1990s, we still used a basal series as our primary text in our sixth grade ELA classroom. This text contained selections of varying length, followed by comprehension questions that were to be completed by the students and then discussed in class. Diligently I read the short stories with my students, and before I graded their submissions, I often attempted to answer the questions first. Rarely did my answers match the provided teacher’s edition answers. I remember thinking that lots of answers could be correct and as long as the students’ responses made sense, that was good enough. By making sense, I believe that I was looking for complete answers, not necessarily answers that could be found in the evidence of the story. Twenty-five years later, a doctoral student showed me Notice and Note and asked if I would like to take a look at it. I borrowed it but didn’t get a chance to read it that week. The next week, she asked for it back. I remember thinking that it must be a pretty important book if she wanted it back right away. I purchased the book, read it, and began a lifetime crusade. For the next couple of years, I offered the book to anyone willing to take it. I bought copies and handed them out to the other teachers of gifted students districtwide. I couldn’t get any takers. Everyone agreed that the information looked promising, but no one felt they had the time to read the book. I decided to take a different route. With trepidation, I offered a book study to my school colleagues. This is my third year at my school, and while everyone is pleasant, I don’t have a team. I teach across grade levels and therefore lack that bonding experience of people who are in the trenches together. Because I teach the pull out gifted program, I may be seen as someone who “doesn’t teach the real kids.” Just recently, a friend chided “You don’t spend much time at the shallow end, do you?” They are right. I rarely have behavior problems, my students are usually engaged, and they tend to learn rather quickly. I was apprehensive that my colleagues would assume that whatever I was promoting was only going to work with smart kids. Within an hour of my posting of the study, eight teachers expressed interest. One teacher could not meet on the day that we had all agreed on due to an unexpected schedule change. On the first day of book study, seven teachers committed to participating! In preparation for the first day of study, I ordered eight copies of the book so that the participants could have the books before the investigation began. Teachers’ days are busy. I believe that when people provide me with the things necessary for me to be fully participative, they are showing me respect. I am the teacher that always has a full can of sharpened pencils at the ready. My goal is for learning to take place. I will ensure this learning at any cost. I also provided a different delicious treat for each session we met. Again, when you take care of the participants, they tend to be more receptive to learning. Building community is a vital component to education. All of the teachers asked if they should do any reading in advance of the first session. I told them that they had the books and if they wanted to read, that would be great. But if they wanted to wait, that would be fine as well. Even though this was a book study, in essence, I saw it as my duty to teach the material. I did not believe that my participants would read outside of our time together. Many of us are just staying afloat in our jobs. Most of us teach 75 students per day. Between preparing for lessons, assessing, and evaluating, our schedules are booked solid. In addition to this work, there have been increased expectations from administration. I did not want someone not showing up because they hadn’t done their homework. The first session, I was ready to teach. The structure of the book is such that the authors introduce each signpost in a lesson format. This is a lesson that a teacher can lift right out of the book and teach the next day. I was hesitant to use these lessons because I felt that if I showed an original lesson, my fellow book club participants would then have two lessons in their toolboxes. However, I thought that the lessons provided by the book might be the best possible examples, and I wanted to make sure that everyone got a chance to see the best lesson. So I decided to use the lessons straight from the book. I had a handout prepared because that lent order to the hour and I was looking for anything that would offer structure. I set up a digital folder on our shared hard drive so that we could easily access any information or handouts from our book club. I would have been much more comfortable buying everyone a new folder and copying fabulous handouts, but my participants are from a digital generation, and I knew that this would be the best way for them to stay organized. I was prepared for a couple of scenarios. It was possible that everyone would enter and have lots of concerns from the events of the day. Another possibility was that people would sit and listen and be nonparticipatory. Instead, I was hit with a barrage of questions. People asked about conferencing, how I set up my reading workshop journals, how did I assess this information, how did I keep track of progress, etc. It was enjoyable. I didn’t have answers to all of their questions, but it was amusing talking about reading and writing with people who seemed genuinely interested. It is my usual style to work with the students in front of me. If the lesson plan had to be scrapped, I usually do not hesitate. I was a bit afraid that they would leave and feel like I had not accomplished our goal. Ultimately, we did get back on track, so I was relieved of those concerns. We read through the short story “Thank You, Ma’am,” by Langston Hughes. It serves as a mentor text for contrasts and contradictions. This signpost alerts a reader when a character says or does something that’s opposite (contradicts) what he has been saying or doing all along. When a reader notices this signpost, she should stop and ask herself: Why is the character doing that? The answers could help the reader make a prediction or make an inference about the plot and conflict. For example, when the woman offers the would-be thief a warm dinner, it is a contrast. Most people would seek to punish a robber, not feed him dinner. This behavior makes us stop and ask why the character is being so kind. This action tells us that the plot of this story may not be one of fear and revenge, but of hope and generosity. During this session, I discovered that people do enjoy doing these kinds of thing during their lunch hour. It was meaningful to me that they seemed to want my help. There appeared to be a thirst for the basic mechanics of how could we accomplish all of this reading and writing “stuff.” I was still very concerned that my solo presentations would grow tiresome, but I knew that sharing this load might result in the material not being covered, and I wasn’t inclined for that to happen. The day after the first session, one of the participants came to me with what she believed an example of a contrast or contradiction that she and her students had found while reading. She was really excited. I missed the first part of her statement. I was completely taken back. Honestly, people don’t stop by my classroom all that often, and I was unprepared for her exuberance. Plus, I think she was wrong. Or I had heard her wrong. All I knew was that I was on overload and not processing well. I pulled it together, but I had to remind myself that I had a whole different “class” now and that I needed to be prepared. I also had to think through how to tell an adult that she was mistaken. After our brief encounter, I wrestled with my indecision. I would never say to a student that she was mistaken. Noticing anything is good. I would gently (if possible) lead my student to what I considered the right signpost. For some reason, I believed that the teacher deserved to know that she was wrong, but I was hesitant to be the one who let her know. As the sessions progressed, these interactions became easier. At the second session, I reviewed CC by reading the picture book Pink and Say, by Patricia Polacco. It was enjoyable to share this story with the group, and they found all of the instances of CC that I had found, so I was assured that they understood CC under this controlled condition. One of the problematic components of this strategy is that sometimes the signposts are hard to find. Becoming discouraged is easy. Like many other reading skills, working with mentor texts enables students to strengthen their skills in such a way that they can generalize the skill to more difficult literary situations. I also read a short excerpt from the book Orphan Monster Spy, by Matt Killeen. It is a young adult book which offered a more sophisticated example of CC. We read through an excerpt of Crash, by Jerry Spinelli. An Aha Moment is easy to spot. It is when a character suddenly realizes, understands, or finally figures something out. When a reader notices this signpost, she should stop and ask herself: “How might this change things?” If the character figured out a problem, the reader has just learned about the conflict. If the character understood a life lesson, the reader has just discovered the theme. I enjoy this signpost because there are specific words that you can teach readers to look for. Realized, suddenly realized, understood, knew, all of a sudden are some examples that almost always point toward an Aha Moment. During this session, I felt rushed. I wanted to review last week’s signposts, and I wanted to work with this week’s signposts, I wanted to give them time to ask questions and talk about what we were learning. This is often something I struggle with. I feel a lot of pressure to pack a lot into every lesson, and it can be uncomfortable. No one was complaining, but it probably could have been more relaxing. After this lesson, I started cutting back on my expectations of how much could be accomplished in a one hour lunch period. I was still wondering if they appreciated the study group. During this session, I distributed twelve short selections that offered the teachers two selections of each of the six signposts. I had found it extremely helpful when I was starting to have user-friendly, short examples to work with. In previous years I have used these short selections as assessment tools to see how well my students were grasping this new strategy. While we hadn’t covered all of the signposts yet, I didn’t want to flood their folders on the last day. I also showed them where they could find a Notice and Note group on FaceBook. This session went very smoothly. Being well prepared but having a shorter plan seemed to be an excellent way to go. I have noticed that most of the teachers are reading the chapter before the session. They were reading by choice. Those who didn’t read weren’t put in the position of having to apologize or defend their situation. During the fourth session, we used an excerpt from Riding Freedom, by Pam Munoz Ryan. The Words of the Wiser signpost is when a character offers some critical advice. The anchor question to answer is “What’s the life lesson, and how might it affect the character?” The answers to these questions will guide the student in recognizing the theme of the story. In this session, I provided the students with a list of picture books that can be used as mentor texts for each of the six signposts. During the fifth session, Hatchet, by Gary Paulsen, showed us how the repetition of words, phrases, actions, or situations might lead us as readers to discover the theme and conflict, or they may foreshadow what will happen later. This lesson is not incredibly exciting, because each selection drives home that his parents were divorced and that he had a secret that he believed his father should know. If I were the authors, I wouldn’t have used a sad AA as an introductory lesson. If I ever host this study again, I will try to find an upbeat selection. During this session, I extended our understanding of AA by reminding the participants of symbolism, imagery, and allegory. I used the example of the role the wolf plays in Hatchet. We discussed how imagery plays such a vital role in literary analysis. I believe that this additional component of our lesson gave validity as these words appear on our district standards. I also provided the group with a list of Disney and Pixar shorts that do an excellent job driving home each of the signposts. I ended our lesson with Lava (DisneyMusicVEVO, 2015) although Destiny (Weibel, 2012) is also an entertaining selection. Both of these shorts show AA in action. I met with one of the participants to see how the signposts were working in her classroom. She mentioned that her class was enjoying the experience and that while signpost instruction may sometimes take a backseat to more pressing issues, she thought that the work they were doing was valuable. She mentioned that she was using the signposts in the students writing workshop conferences. We talked about how easy it is for the students to add sophistication to their written work by having a repeated image, or an aha moment. We also talked about when a character changes resulting in a continuation of the plot arc, this is often a contrast or a contradiction. These writing tools were enabling the students to become more confident authors. As the students introduce the signposts in their works, they may see these signposts more readily in their future literary reading. We both see this as a very fortunate win-win. During the sixth session, we used a selection from Hope Was Here, by Joan Bauer. This signpost directs students to consider why a character’s flashback or recollection might play a critical role in the novel. It may lead to further understanding of theme, conflict, or might foreshadow what may happen later. The selections chosen for the introduction of this signpost are especially riveting. Each time I teach this lesson, my students are usually more interested in the story than they are in learning a new component of Notice and Note. The adults were no less intrigued. Choosing good books is a critical task. The selections used will flavor the experience. My last gift was a bit of a bust. I had organized a list of songs that each reflected a different signpost. For example, “Glory Days” by Bruce Springsteen (Memory Moments). “Don’t Stop Believin” by Journey (Words of the Wise), “Cats in the Cradle” by Harry Chapin (Aha Moment) and “ThankU” by Alanis Morissette (Contrasts and Contradictions). I thought it would be charming. Most of the participants did not know the songs. Whoops. On this final day, I distributed a five-question exit ticket to determine if the book study had met the needs of the group. The following are the results. On a scale of one to ten, how much did you know about Notice and Note strategies before the book club experience? Five participants wrote that they would describe their knowledge at a 0 or 1. One participant wrote that she would rate herself a 4. She knew of the skills, but not the names of the skills. On a scale of one to ten, how much do you now know about the signposts? The respondents averaged a little over a 9. One wrote that she knew she would be a ten as soon as she taught them to her students! On a scale of one to ten, do you think that you will use these strategies in your classroom? The respondents all answered 10. The instructional consultant who was part of the group wrote that she planned on sharing the information with other teachers. If you are planning on using these strategies, what might get in the way of you feeling successful? The respondents offered a variety of answers. Time; When students try to find them in their independent books; Not being prepared enough. I was so nervous to do the first one that I felt I fumbled a little through it, even though I knew it. Also, finding more resources and ways to assess their understanding of the signposts; Being able to adequately explain them to my students. What are some ways that book club could have been improved? (I reminded them that I really thrive on honest feedback.) Was it too varied or too ”same” every week? Was it too much reading at you and not enough discussion or too much discussion and not enough real teaching? Again, there were a variety of responses. The book club has been very informative and beneficial. I appreciate all of the resources provided; I liked that you went through the exact lessons in the book so I will know how to teach them to my students; I liked that you read the story to us. I would have liked to know the exact step of what you would have done with the students following the story/lesson. What/how do you summatively assess them. Thank you. I really enjoy it and learned a lot; I know I’m being kind of Pollyanna here, but I really thought it was great! The reading amount was manageable and really easy to read; I thought the presentation and discussions were right on point. I look forward to being able to discuss this more as I implement it in my classroom. The logical next step is that I meet with these teachers again and offer continued support. In reality, I am only about two years ahead of them in understanding how to use these signposts. I know that I have much to learn. It is reasonable that they could also benefit from refresher activities or sessions. I have spoken to the principal and offered to do additional professional development either for their teachers or for others in our school. I know that we could all benefit from Notice and Note Nonfiction. Bauer, J. (2015). Hope was here. New York: Putnam. Beers, K., & Probst, R. E. (2013). Notice & Note: Strategies for close reading. Portsmouth, NH: Heinemann. Hughes, L., Harper, D. S., & Rampersad, A. (1997). Short stories Langston Hughes. New York: Hill and Wang. Park, L.S. (2010). A Long Walk to Water. New York: Clarion. Paulsen, G. (1999). Hatchet. New York: Simon & Schuster Books for Young Readers. Polacco, P. (2003). Pink and say. New York: Lectorum Publications. Ryan, P. M. (2007). Riding Freedom. New York: Scholastic. Spinelli, J. (1996). Crash. New York: Random House.